Most diamond jewelry items require some form of assembly operation by the jeweler. When this happens, there is usually one or possibly multiple solder joints on a piece of diamond jewelry. 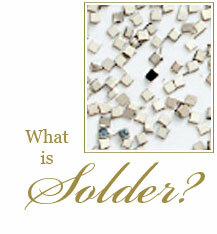 Solders are also alloys, just like the alloys your jewelry is manufactured from. But solders need to fulfill several specific criteria for them to work as intended. Firstly, the solder alloy must melt at a lower temperature than the components it is to join, such as a shank and setting. To achieve this, the solder designer changes the composition of the parent alloy to include metals that when added in certain ratios will sufficiently reduce the melting point. But this can change the color of the solder when compared to the parent alloy, resulting in a visible seam of solder at the joint. All solders used for Danforth Diamond jewelry have been painstakingly designed and perfected over decades to ensure that when your diamond jewelry is finished, any solder joints are invisible. At Danforth Diamond, any jewelry that requires an assembly operation incorporates "plumb" solders only. Some solders have their melting point lowered by alloying less gold - lowering the karat. These are usually known as "repair" solders. Plumb describes a solder as having the correct gold content for that karat range - 18 karat plumb gold solder contains 75% gold, identical to 18 karat jewelry gold alloys. In most diamond jewelry alloys, gold is the metal with the highest melting point, and so as a rule of thumb, less gold = lower melting point. It is not illegal to use a solder of lower karat than the diamond engagement rings, as long as the overall gold content of the piece does not drop below the legal minimum specified assay tolerance of 0.7% below karat if a solder join is present. A downside to using lower karat solders and taking advantage of the negative assay tolerance law (thus reducing manufacturing costs!) is that the lower karat solder can tarnish at a much faster rate than the higher karat jewelry piece, making the solder joint visible over time. At Danforth Diamond, we want you to have the best diamond jewelry available. All the solders used in our assembly operations are plumb quality and are specifically designed to color match the karat alloy. The resulting solder joint, once polished, is invisible to the naked eye. Ready to start shopping? Browse our collection of quality diamond jewelry today.